The circulatory system is often refered to as the cardiovascular system. In its simplest form, the circulatory system may be explained through a process of plumbing, involving the heart (the pumpt), the blood vessels (the piping) and the blood (water). The heart pumps deoxygenated blood (blood without oxygen) up through the pulmonary artery into the lungs, where each red blood cell collects oxygen. It is then returned to the heart through the pulmonary vein, and then pumped by the left ventricle of the heart (the main workhorse), through the blood vessels (piping) of the body, where it distributes oxygen to all the cells. Blood leaving the heart is pumped through arteries, which become smaller and then are called arterioles, followed by by body capillaries (where the last of the oxygen is removed from the red blood cells), the blood then returns to the heart via small veins called venules, followed by veins and then re-enters the heart through the vena-cava. 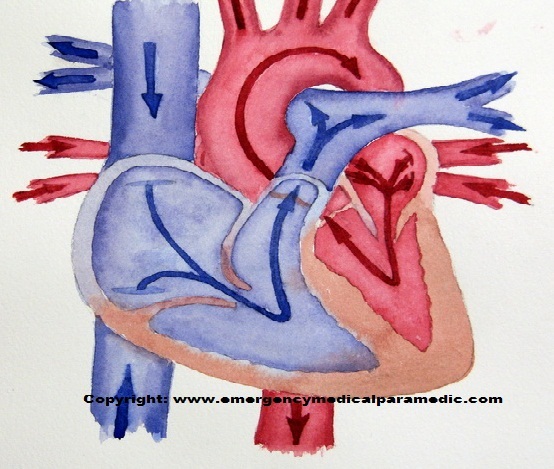 The heart perfuses itself first (provides oxygen) by sending oxygenated blood into the coronary arteries off the aorta. It is also important to note that the heart gets its oxygen from blood which is pumped through the coronary arteries, and not through the left and right ventricle chambers. This is why coronary artery disease is associated with such a high mortality rate. 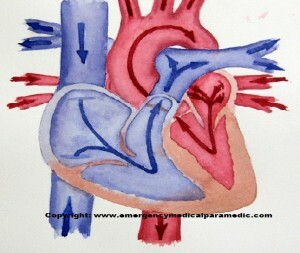 To learn more about cardiac chest pain please follow my link to Chest Pain.